Is Ethereum Moving Closer to Becoming a Unit of Account? Now that privacy has largely been solved, according to Vitalik Buterin, ethereum’s inventor, and scalability has conceptually been solved with clear road-maps laid out and only implementation left, digital currencies, and ethereum in particular, may be moving towards use as actual money. Money is defined as something that is used as a means of exchange, is a store of value, and acts as a unit of account. Digital currencies are an excellent means of exchange and unarguably perform that function far better than any other candidate. They can be transferred to anywhere in the world as good as instantly and at a current fee of $0.009 for eth. They can move in a peer to peer manner like cash, but where cash is limited to only physical use, digital currencies can also be used online. For cash to perform that latter function it needs to operate through intermediaries, like credit cards or banks. That gives rise to monopolies due to economies of scale, and as we all know monopolies lead to abuse. Current university students might have been too young in 2008, but the events of that year are not unique. Banks tend to go under, at a minor scale every 10-20 years, and at a major scale every century or so. When they do, we can’t just let them go bankrupt because, in effect, they hold all our money. So everyone has to pay for their mismanagement of our money. This century, we might have gotten off lightly. There have been increased tensions, but nothing at the scale of last century when two world wars were directly or indirectly caused or precipitated by major bank collapses. The lack of an intermediary, therefore, is not a luxury, but a necessity when it comes to money. It is true that digital currencies do not fully make intermediaries nonoperational. They can be more convenient and many may choose to use them. But they are not necessary, as is currently the case with cash. They are not necessary because digital currencies can be used in all mediums, in their native form, without the assistance of any third party. Because of this, and other qualities, even economists that are massively opposed to digital currencies would most likely acknowledge that they are an excellent, and really the best, means of exchange. That in itself, however, is not sufficient. Money in and of itself is useless. You can’t eat it, you can’t live in it, it can’t transport your to work, it can’t itself heat your home, and so on. The only purpose of money is to itself act as an intermediary of sorts so that things can be exchanged. To perform that function it stores value. The value of your many months of work is stored in this intermediary we call money which then can be exchanged for someone else’s months of work and resources, such as a car. For something to store value it needs to be durable, non-forgeable, somewhat limited in quantity, and it needs to be a good means of exchange, that is, easy to transport and so on, which also includes the need to be accepted by others in exchange for goods. Digital currencies are currently not a great store of value because they are still in a bootstrapping phase. They are accepted for goods only in limited amounts and due to their considerable growth potential they can act as an investment far more than a currency. This limited amount of adoption and use in commerce creates considerable volatility in price surges and falls which can erase what value has been stored or make it unpredictable. That in turn makes them very risky for use as currency. That’s where the third aspect of money comes in, the unit of account. Digital currencies are currently mainly valued against fiat currencies. If you say, for example, 1,000 eth, you probably have a rough idea whether that is a lot of money or very little, but do not quite “feel” how much that is exactly. While if you say $20,000 or $1 million you instantly understand its value. That’s because when you buy a piece of bred you don’t pay 0.001 eth, or when you finish your weekly shopping you don’t check to see that you now have 2eth left in your current account after paying 0.1 eth to feed yourself and/or family for the week. Instead you pay $1 for milk, $50 for your weekly shopping, and you see that you have $400 or whatever left in your non-savings account. As such you instantly know what you can get for $100, but unless you check the price of eth, you don’t know what you can get for 1 eth. Unit of account is the holy grail of digital currencies and it is the most difficult to achieve out of the three because an entire ecosystem, supply chain, and so on, needs to be created that operates solely in eth. However, we are seeing trickles of it, just two years after ethereum’s invention. 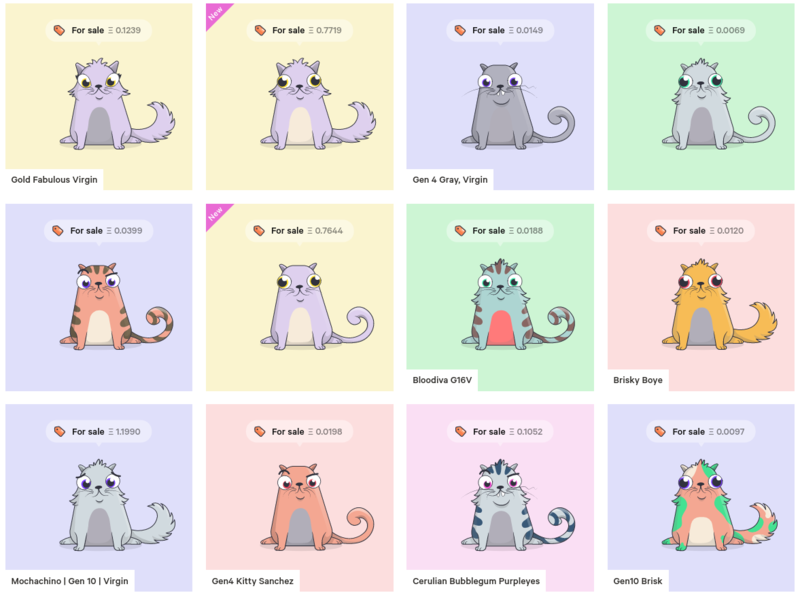 Cryptokitties is currently the only environment that operates solely on eth and uses it as fully money. As you can see above, everything is priced in eth. Beyond buying and selling, the platform has other functionalities, such as breeding, and that is priced in eth too. In fact, you never interact with fiat in this environment, unless you do not have any eth, and even then, only to the extent of converting fiat to eth. However, as this is so new, you still need to, at least mentally, convert the eth amounts to dollar values so as to discern whether it is a price you are comfortable paying. The reason for that is because eth is not widely accepted, so we are not familiar with this unit of account. To reach a level where it is widely accepted there would need to be some pioneers who start living in a new world where they are paid in eth and spend in eth. It may be the case that world becomes the future, or it may be the case that world never becomes a reality. Bitcoin was close to it, but failed miserably through its own misdoing. Ethereum has a good chance, primarily because of daaps. Decentralized apps are blockchenized websites or apps that allow for numerous functionalities, including the tokenization of goods. As these are new and often innovative inventions which sometimes are only functional if payments are made in eth or some other token, they may act as pioneers in pricing goods or services in eth. 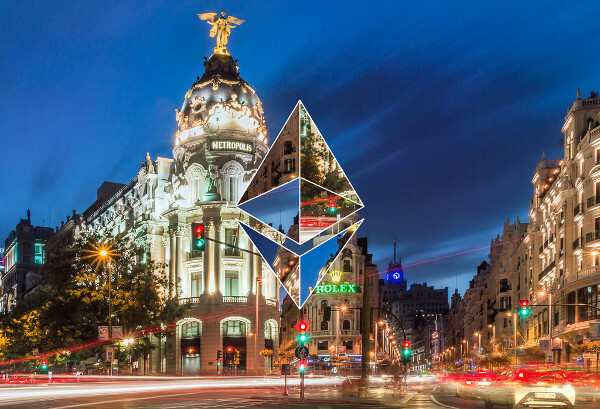 After a tipping point, once a sufficient number of individuals are familiar with eth as a unit of account, the phenomena quickly spreads and becomes a new reality, with the rest wondering how it all suddenly happened. That may never happen, but if that goal is achieved where 1eth=1eth regardless of what the dollar does, then volatility would be greatly reduced. Take the pound, it stupendously dropped against the dollar last year, but as the vast majority of Britons get paid in pounds, no one really noticed or cared. Their £1,000 could still buy them however many breads or weekly shoppings. As such, even though the pound has been very volatile against the dollar, its use as a unit of account erased short term volatility. Gradually, of course, inflation kicks in, but if everything was priced in dollars, it would not be gradual. Instead, Britons would have woken up one day to suddenly find out their £1 can now buy only half a bread. Something that would have been catastrophic. That’s what currently happens with eth. As everything is priced in fiat, daily volatility instantly affects eth based commerce, but one eth, even if it drops 50% against the dollar or rises 200% against the dollar, remains one eth. Its utility as a store of value and means of exchange has not in itself changed. The number of eth has not doubled because its price rose or fell. The only thing that has changed is the temporary valuation of eth against the dollar. Something which would not matter in the short term if eth was used as a unit of account. Because that unit acts as a floor. There would be a certain level of demand which would remain at that level and even gradually increase with economic growth and productivity gains. It is because of this unit of account that fiat can be printed in trillions and still not instantly affect economies due to growing economic activity and thus growing demand. Without this unit of account one can not really call it money because it would not act as a store of value as it would not have a base level of demand, unless that demand came from some other aspect of its utility. Nor would it really act as a means of exchange because what would really be accepted is the fiat equivalent. But if an ecosystem that used eth as a unit of account, even if limited, was created, then a certain level of independence and economic freedom can be gained, and the greatest experiment on earth can begin. The start of which we are now seeing, with pockets of crypto unit of accounts here and there, growing with the growth of new dapps and ethereum’s ecosystem, as that pursuit of free market money continues.